A few weeks ago we got a surprise inquiry from the folks who make Obsello, a new Spanish absinthe. They wondered if we would like a bottle to try and we of course leaped at the opportunity. Mind you, there was no requirement of any "quid pro quo", just that they would send us a bottle and we would tell you our honest opinions after trying it. The bottle arrived the other day and we immediately scheduled a tasting. 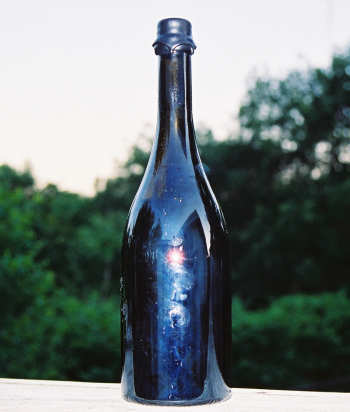 Unfortunately, as you can see, the bottle lacked a label, which, given the nice look of the web site, was both disappointing and, to be honest, a little intimidating. I mean, someone contacts you by email and then mails you an unmarked bottle, asking you to try it? But we decided to persevere and take one for the team, so on we went. It was very securely sealed in wax and cork, so it took some effort to get opened. The bottle had a twist off cork, which is convenient. The first whiff was very promising - a subdued yet distinctly absinthe aroma, with some interesting herbal hints. We each poured out a good sampling and smelled some more, still enjoying the aroma. The color was a very natural looking color, albeit with some hints of a beige or brown. The big decision when trying a new absinthe is whether to use sugar or not. Given the Obsello's relatively low alcohol content (50%, which is very low for an absinthe, as they can get as high as 72% or more), we did one with a single sugar cube and one with no sugar at all. Then comes the next big decision - how much water. We did our usual 3 or 4 to 1, which, it turns out, is probably a little too much. But the louche was good, although it did seem to retain the earthy colors of the original. Not sure if you can tell from the picture, but there is a definite brown tinge to the drink; not at all off putting, just unexpected. And the taste was good. As I said, later mixes went much lighter on the water and enabled the more subtle tastes to come through better, but this first taste was positive. 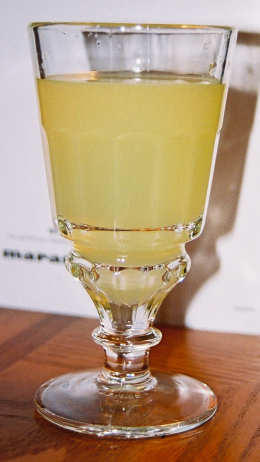 It certainly lacked that "bite" that a stronger absinthe has, but it still had enough to impress. The flavors, while not big and bold, were smooth and confident and we enjoyed it quite a bit. In the end, as we eased up on the water, we decided this was a solid absinthe. It worked both with and without sugar and had a good if not powerful taste. 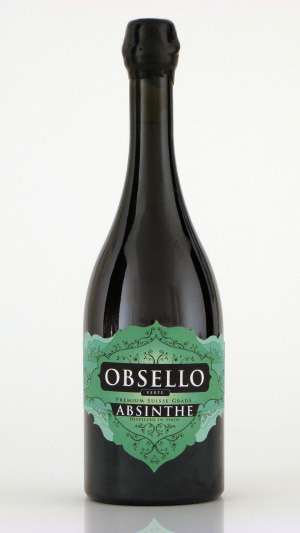 Obsello would work very well as an introductory absinthe, yet is good enough for the more sophisticated palate. Probably about a 7 out of 10 for a rating. Keep up the good work! See the discussion forum on the Wormwood Society site for more discussion, including several posts by B. Alex, the maker of Obsello Absenta. It can be found here. The color is an interesting thing we are monitoring. I suspect it is rather unstable at 50% alcohol and I think that bottle got a bit of direct sun in the distillery while waiting to be shipped. We are looking at this closely.